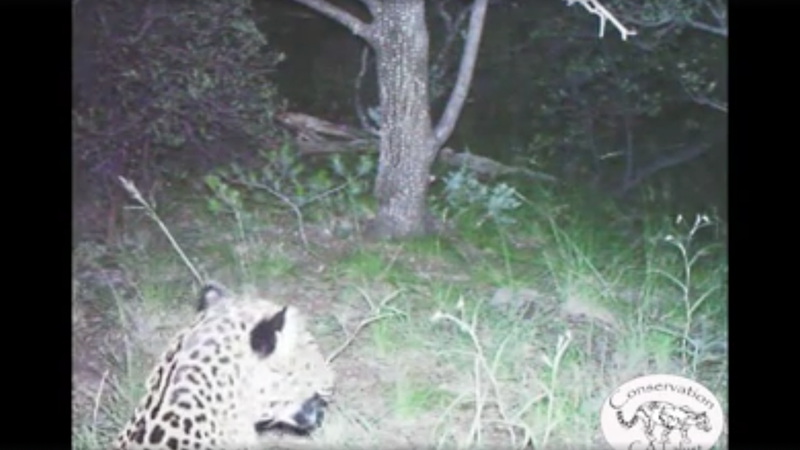 Having been photographed dozens of times by camera traps, El Jefe is the first confirmed jaguar in the United States since 'Macho B' was euthanized in 2009 due to injuries. Researchers have determined that El Jefe is an adult male in his prime. El Jefe's health and ferociousness will do little to protect him against the man-made challenges currently occupying this remote region of southeast Arizona. According to the press release, a potential open-pit mine could fall right in the cat's territory. "The mile-wide open pit and 800-foot-high piles of toxic mine waste would permanently destroy thousands of acres of occupied, federally protected jaguar habitat where this jaguar lives," it states. According to conservation advocate Randy Serraglio, the "mine is the intersection of three major wildlife corridors that are essential for jaguars moving back into the U.S. to reclaim lost territory." Jaguars once roamed across the western United States but were hunted out of existence by the mid-1960s. Shortly thereafter Arizona banned jaguar hunting. Currently the species is considered “near threatened” and is protected by the UN Convention on International Trade in Endangered Species. Habitat loss, poaching of prey, and fragmentation of populations continue to plague the stealthy big cats. The largest cat of the Americas, jaguars once inhabited much of Central and South America, however they now primarily exist within the rainforest in the Amazon basin.